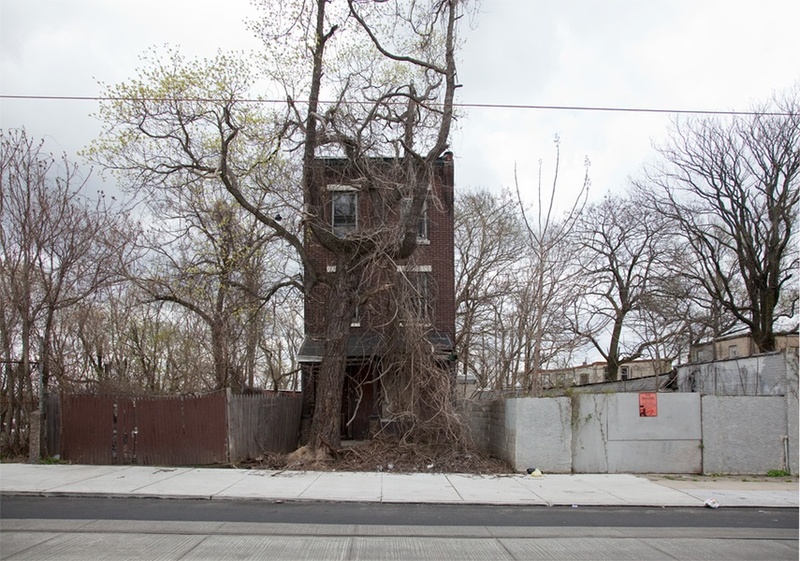 photo-eye Gallery Photographer's Showcase: Ben Marcin's Last House Standing photo-eye Gallery is pleased to announce a portfolio from Ben Marcin, Last House Standing. We are pleased to release a portfolio of images by Ben Marcin on the Photographer's Showcase. 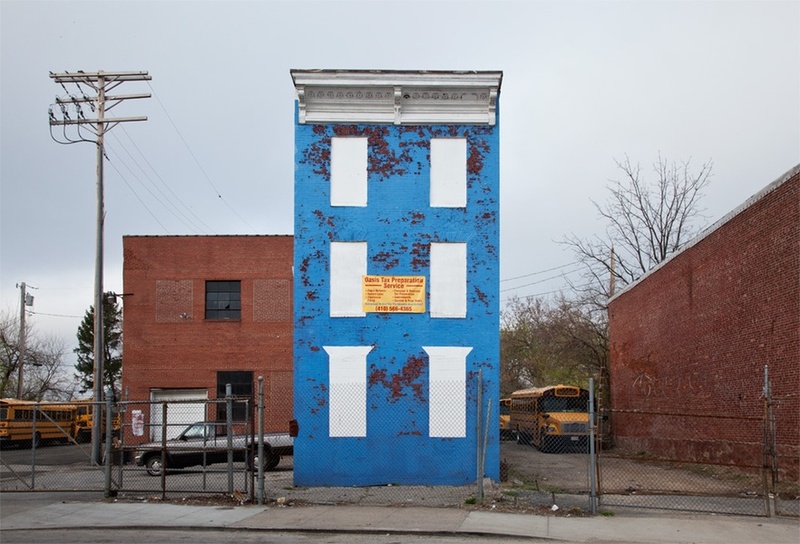 Last House Standing features Marcin's documentation of free-standing row houses, buildings that were once linked with many others of the same style and structure. Often three stories, the buildings have slowly been torn down as they fall into disrepair, but occasionally one unit will remain, a standout against a disintegrating neighborhood. Ben Marcin found row house holdouts throughout the Mid-Atlantic states, capturing examples in New Jersey, Maryland and Pennsylvania, places where these nineteenth century buildings were common. Once a symbol of tidy uniformity and designed to be densely packed, these buildings now look strange on their own. 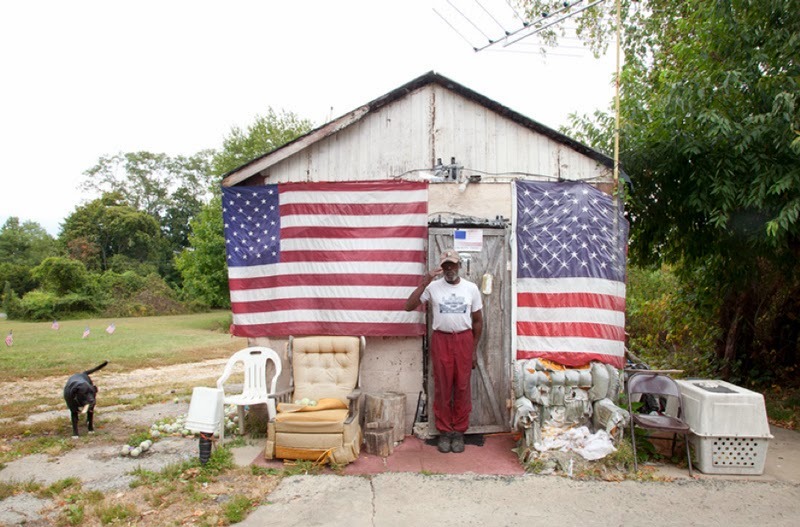 Marcin often found them in rough neighborhoods where the housing crisis hit hard and poverty looms large. The images are not striking simply because the houses are severed from the identical buildings that once surrounded them; at the edges of the scene things also look a bit gloomy. Bare trees and empty lots are everywhere. The occasional car makes an appearance but the scenes are otherwise deserted. While a few of these houses may still be occupied, one gets the feeling that life has largely moved away from these areas. Anne Kelly asked Marcin to tell us about this series and his start as a photographer. Anne Kelly: You purchased your first camera at 27. What or whom inspired you to do so? Ben Marcin: I started out making watercolor paintings in my early twenties but I lacked the talent and patience to pursue it seriously. It occurred to me that photography might offer an easier way to express myself so, at twenty-seven, I bought my first camera — a Minolta X-370. I saw it in a Sears sale flier for $149. It was a wonderful camera but it would be years before I started taking good pictures. I didn’t go to art school — I learned almost everything on my own. 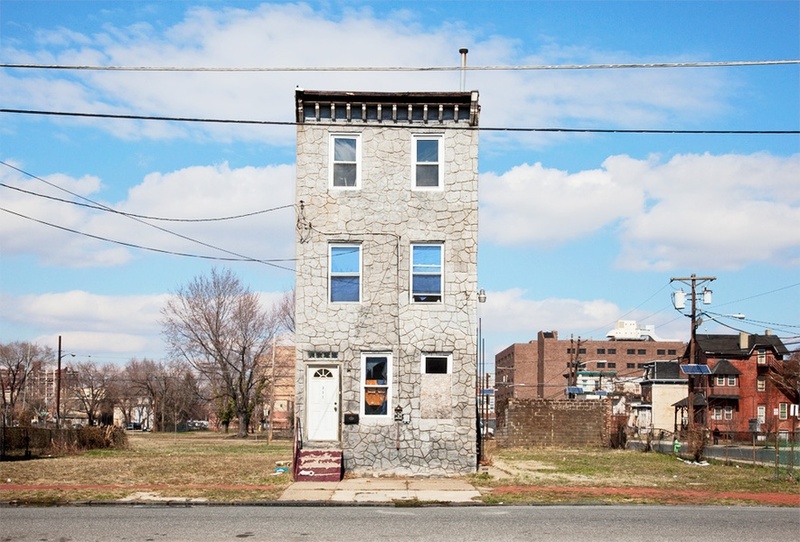 AK: Tell us about the first row house photo you shot. 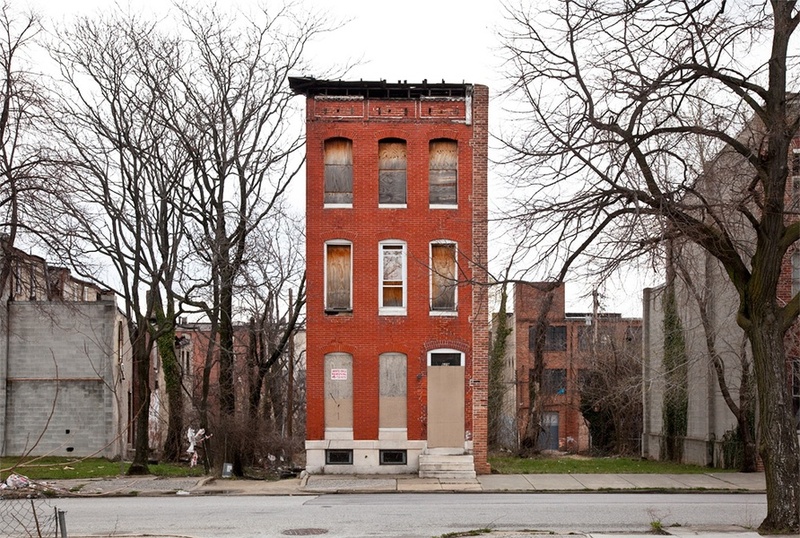 BM: I found this unbelievable solo row house while biking through the west side of Baltimore. It was bright blue and its six front windows were boarded up and painted white, glowering at me in broad daylight. The front door had been removed years ago but the nineteenth-century cornice adorning the roof was still intact. It was such a strange sight in a very rough neighborhood. I returned home to get my camera and took the shot the same day. Just down the street was another solo row house, painted one shade of tan over another. That was how my Last House Standing project was born. By the way, these buildings are, in fact, quite rare. Normally, the entire block goes, by way of fire or the wrecking ball. AK: You were born in Germany and moved to Baltimore as a child. Do you think that had an impact on your work? BM: My mother is German and my father was Polish, by way of Russia. I spent most of my first ten years in Germany. I had a very European upbringing relative to my American friends. Both of my parents adored classical music and art. After we moved to the United States, my father got a job working in the Rare Book division of the Library of Congress and he brought home all kinds of art books for me to look at. Once he moved up a few centuries, I started to get interested. The game changer was the day he brought home a monograph of Emil Nolde’s landscape watercolors. AK: There is an absence of people in your work — talk about that. BM: That’s true, I almost never photograph people. I spent some time travelling through the Mayan Nation twenty years ago and I photographed a lot of the indigenous Indians then. At some point, I decided to tell the story via the absence of people — kind of a negative space approach. I recently made one rare exception — the dog’s name is Roxeanne. AK: Anything else you would like to mention?